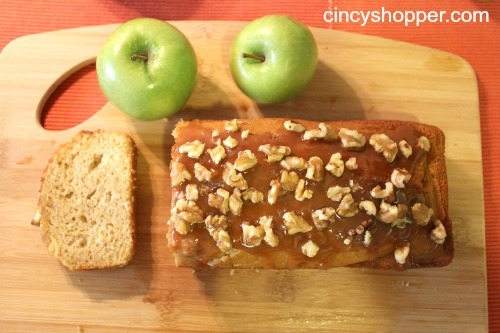 Looking for a yummy Caramel Apple Loaf Cake Recipe? This fall weather really has me in a baking mood. The chill in the morning here in Cincy has really made me realize that fall is here. I have mentioned in quite a few of my posts how much I really enjoy eating apples and caramel in the fall. I remember dropping by the roadside stands as a child to grab a jug of cider. I was always anxious to get home and consume up all the apple goodness. I will admit that I was known to overdue it on the apples ha ha! I am still the same as I was when I was a child anything with apples excites me. Can you tell that I like food just a little bit too much? Last weekend I made this yummy Caramel Apple Loaf Cake. Pure yumminess is all I can say. The hubby was trying to snag himself a piece. One piece was all I was allowing him to consume. This caramel apple goodness was mine for the weeks late breakfast. I will admit I consumed this loaf all week long and probably gaining some poundage on this body of mine with all this baking. 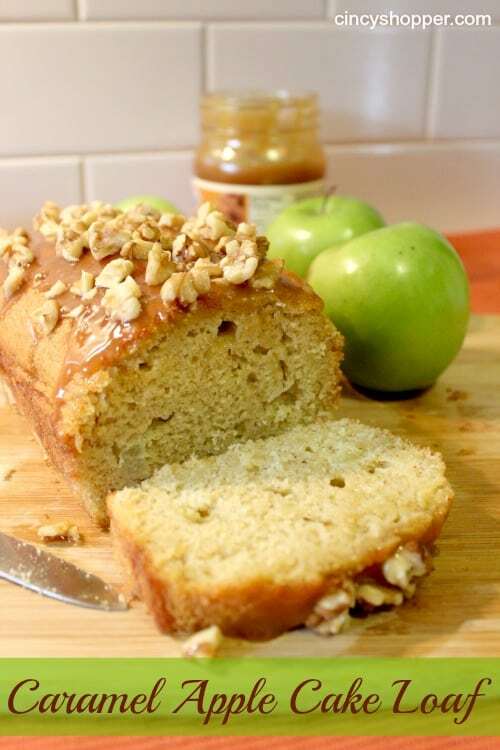 This Carmel Apple Loaf cake like many of my recipes is quick and easy. I like to use all those cheap cake mixes that I purchase with my coupons to come up with something a bit unique. This recipe uses one of my cheap cake mixes, apples and my cheap caramel ice cream topping (yes, I purchased it with coupons too). This cake loaf is great for early morning breakfast, an afternoon snack, evening snack with coffee or I would say anytime. I will consume it all day long. If you have many of those cake mixes in your pantry whip yourself up a batch of this apple goodness. Looking for other apple recipes? If so check out more of my apple recipe ideas here. This looks terrific. Thanks for sharing it and we love your website! YUM! What a perfect recipe for National Apple month! This sounds delicious, sweet, and a bit savory. Thank you for linking up with mouthwatering mondays! This sounds so delicious – and simple. I have friends coming over this weekend, I think this may be on the menu! I am all for caramel and apple in just about anything! This is a beautiful Apple Loaf, looks delicious. Thank you so much for sharing with Full Plate Thursday and have a fun weekend!